Many people, when they think about fair trade, think about food or they think about handicrafts. Many people, when they think about body care products, think about what those products can do for their skin or hair. Though fair trade and body care lack an immediate association for many people, the two have a meaningful connection for many producers and brands. And why not? Nature provides so much that is good for our bodies and these components that are agricultural or collected in the wild are what marks many high quality products, rather than chemical inputs created in labs. Yet, supply chains for many ingredients used for popular products are plagued by exploitation. To ensure high quality ingredients through fair supply chains, some brands are part of the fair trade movement. Fair World Project recently visited projects of two of these brands—Alaffia’s main supply chains in Togo and Dr. Bronner’s sustainable palm oil project (palm oil is the major component of its bar soaps) in Ghana. Both projects provide jobs at local processing facilities as well as ensuring fair trade principles are met for the farmers and wild collectors. We’ll talk more about what we learned about both of these supply chains over the coming months, but will start with just one example of the ripple effect fair trade can have in communities. Shea butter is key to many of Alaffia’s body care products, including soaps, lotions, and hair care products. Alaffia works with 4,000 women organized in 127 collectives throughout the central part of the country. 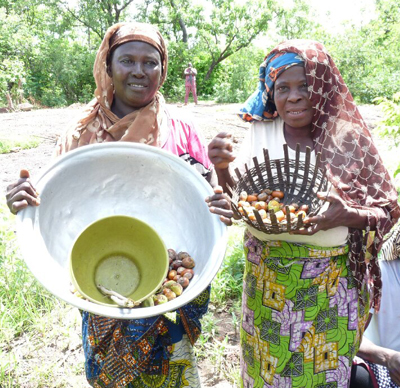 These women collect shea nuts as they fall from trees near their villages, help one another to get the nuts ready for sale, and collectively negotiate contracts with Alaffia or other buyers. 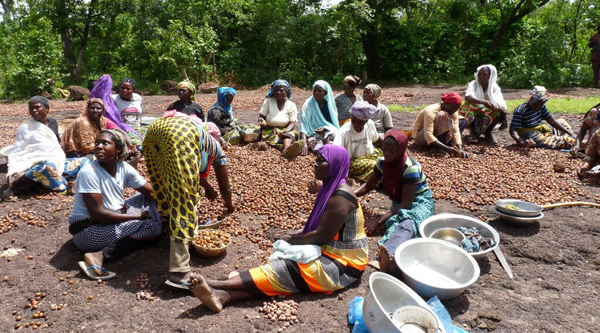 Women who collect shea nuts are typically exploited in the market place and paid very poorly for what they have collected. Alaffia commits to buying shea nuts 15-25% above market rate. This can have a huge impact on family incomes. But there is more. By paying fairly and empowering the collectives to negotiate, prices for the entire local market of shea nuts have gradually risen over the 15 years that Alaffia has been buying them. That means that even the women who are not selling the shea nuts to Alaffia have benefited from price increases. This is a great example of the way that fair trade can start to change the entire system. Thank you Alaffia and Dr. Bronner’s. I use your products because of this. Love the products and values of both these companies! Congratulations on a job well done! I’ve been buying Dr Brothers for years just because it’s a great earth friendly product. This is a high bonus. I will now look for Aliffia’s products as well. Together we can change the world!